broke before I even used it! A GREAT CAMERA THAT I WOULD BUY MORE OF IF THEY WERE AVAILABLE. ECONOMICAL CAMERA WITH THE FEATURES OF CAMERAS COSTING 5 TIME THE PRICE. I decided to move from film to digital and after much consideration I decided on this one. This is a great little camera! The pictures are wonderful on camera and when printed with the G600 or my home printer. The camera and printer dock are extremely easy to use. It also comes with a program that allows you to post your photos online and e-mail the to friends and family. This worked out great for me with distant relatives. I also bought a 512mb memory card to go with it. ***I do recommend that you use the lithium batteries. The alkalines that came with the camera went within 48 hours of me receiving the camera. (camera would not turn on after being shut off and would shut off on its own before preset shut off) The camera works great with the lithium battery. This is a great choice if you want great photos (of the kids) with little effort! I bought this camera as a replacement for my KodakCx7530 for about the same money it would have cost me to have the 7530 repaired. I was very happy with the 7530 until it started to put pink overtones on all PICS. My new C743 is even better than the 7530. I love it.I have not taken any Sepia or Black and whites yet so have no comment on them. This is the ideal starter camera for a beginner. I found it easy to use and simple to get started with. However the software that comes with this camera is not so great. It runs slow on my system and has features that most people won't really ever use such as a greeting card maker. 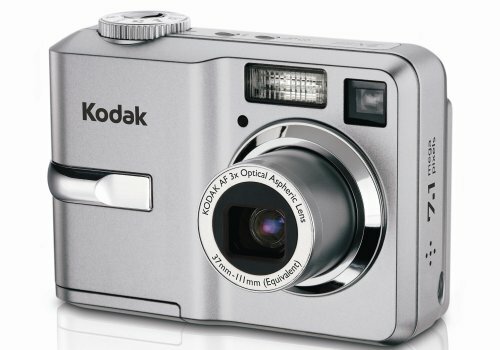 This I believe is my eighth or ninth digital camera and all but the first one was a Kodak EasyShare. And unfortunately all but two have met their demise at my hands. I love to take my camera where ever I go and my wife cringes every time I go out. I am in the Army and love adventure sports. The combination isn't well suited for camera handling and I do my best at trying to take care of them. The last camera that I purchased (before this one) was an EasyShare 643 that I bought before deploying to Iraq in January and it lasted until July when it took one too many tumbles from atop my HMMWV (Hummvee). Picture it and print it.